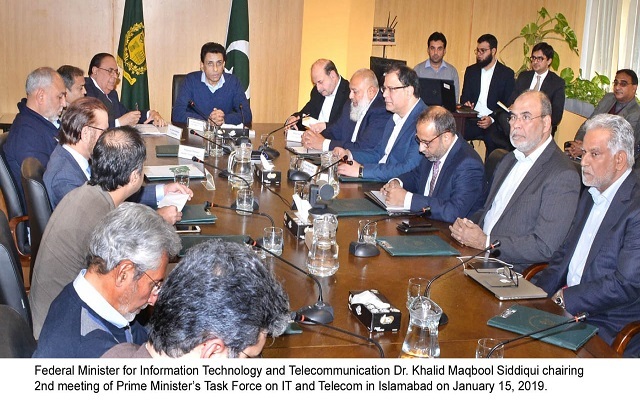 Federal Minister for Information Technology and Telecommunication Dr. Khalid Maqbool Siddiqui chaired 2nd meeting of Prime Minister’s Task Force on IT and Telecom at the committee room of Ministry of IT on Tuesday. Federal Secretary Ministry of InformationTechnology and Telecommunication Maroof Afzal also present in meeting. Dr. Atta-ur-Rehman attended meeting as co-chairman of PM Task Force on IT and Telecom. The Sub Task Force on IT gave recommendation for setting up of special technology zones in the country for enhancing IT exports. It is observed that image of our IT industry will enhance by establishing special technology zones in country. While speaking, Dr. Atta-ur-Rehman said that instead of setting up of special technology zones from the start while developing land for this purpose, existing buildings or infrastructure can be designated as special technology zones. About spectrum, Dr. Atta-ur-Rehman said that spectrum should be allocated in right manner. He also emphasised need of promoting locallay manufacturing products like mobile phones, computers, laptops etc. It is also proposed that IT related small and medium enterprises (SMEs) should be empowered by establishing special tecnology zones. The members of the Sub Task Force on Telecom observed that the telecom taxes in Pakistan highest in the world. It was proposed that 12.5% Advance Income Tax on Internet must be zeroed. The meeting was told that 1000 union councils in the country have fiber cable connectivity and it is target to connect 3100 more UCs with optic fiber cables for broadband supply.